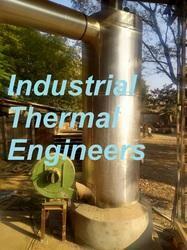 Leading Manufacturer of wood kiln from Ahmedabad. Length as per your need. Owing to the years of experience, we are able to offer a wide assortment Wood Kiln to our clients. The offered product is designed using high grade material, procured from repudiated vendors of the industry. In addition to this, the offered array is checked on number of characteristics so as to ensure its compliance with the internationally laid norms and standards. Moreover, the offered range can be customized as the requirements of respectable clients. Looking for Wood Kiln ?